The Planter's Camp at Kirudale, Madapur, Coorg District, in Karnataka, India is an Eco Adventure Camp which provides a walk through nature's pristine presence in some of the oldest untouched forests nestled in the midst of coffee, cardamom and pepper plantations.Planter’s Camp at Kirudale provides guests a unique experience of living in the heart of untamed nature. The camp is an exclusive retreat for nature lovers who can enjoy the stunning beauty of sacred groves, hear a varied bird population and watch the changing moods of a rivulet or the waterfall as it melts into white foams on brown rocks. 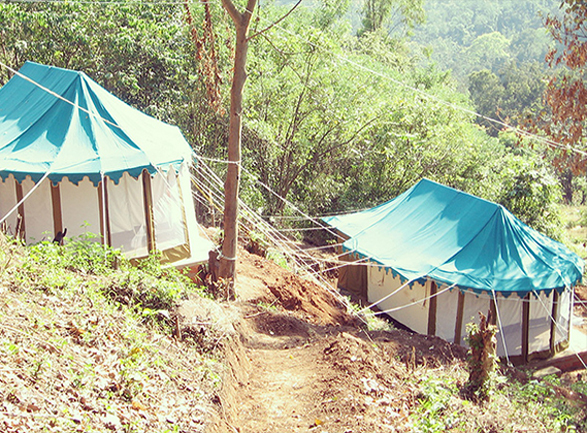 Read more..
Speciality – Comfortable and Spacious Tents. Excellent mobile and wireless internet network. Food Available – Traditional Coorg Cuisine – both vegetarian and non-vegetarian. The camp is an exclusive retreat for nature lovers who can enjoy the stunning beauty of sacred groves, hear a varied bird population and watch the changing moods of a rivulet or the waterfall as it melts into white foams on brown rocks.The camp is an exclusive retreat for nature lovers who can enjoy the stunning beauty of sacred groves, hear a varied bird population and watch the changing moods of a rivulet or the waterfall as it melts into white foams on brown rocks.The camp is an exclusive retreat for nature lovers who can enjoy the stunning beauty of sacred groves, hear a varied bird population and watch the changing moods of a rivulet or the waterfall as it melts into white foams on brown rocks. The camp is an exclusive retreat for nature lovers who can enjoy the stunning beauty of sacred groves, hear a varied bird population and watch the changing moods of a rivulet or the waterfall as it melts into white foams on brown rocks.The camp is an exclusive retreat for nature lovers who can enjoy the stunning beauty of sacred groves, hear a varied bird population and watch the changing moods of a rivulet or the waterfall as it melts into white foams on brown rocks. The camp is an exclusive retreat for nature lovers who can enjoy the stunning beauty of sacred groves, hear a varied bird population and watch the changing moods of a rivulet or the waterfall as it melts into white foams on brown rocks. Wow! What a place! Excellent location. Great hospilality. Excellent food. Need for selective publicity for nature loving people. Keep it up. Excellent service and it is one of the wonderful place to relax with family for the busy worklife people. World talks about work life balance your family life given if it is short duration. Green & lush trees all around & warm & friendly people coupled with great food , makes this place an excellent place to relax & enjoy. All staff here were very warm & friendly, will recommend this place for adventures at heart!! Nice place to chill. Place and happiness. Excellent Hospitality Needs more publicity. Best Place to rejuvenate! The attractive aspects of this place are the tents, great food & good hospitality. It was a pleasant change for us. food quality is excellent. Kavan & his team are working at their best to provide excellent hospitality. More marketing is required for this place.